NuDzine Kidsafe Belt for Two Wheeler – Find great deals on Kidsafebelt.com for Child Safety Belt in Baby Car Safety Seat Accessories. Shop with confidence. Find great deals on Kidsafebelt.com for Child Safety Belt in Baby Car Safety Seat Accessories. Shop with confidence. … from winning this comfortable and sleek KidsafeBelt..! Go to Cute Kid Contest page on our website. Fill in your child’s details. Upload your child’s picture… That’s it ! Winner will be announced on the same page. So keep a watch on who’s participating.. and the winners ! Don’t miss this out ! Does originality really matter anymore? We believe it does. Yes. Originality in a business is not only healthy for any business, but also speaks a lot about the core belief of a business. It speaks about the passion, commitment and competencies of a business to not only sustain, but also put itself on a growth map by being connected. Being innovative and creating something different builds the essential and much required component of leadership. It makes one stand out, away from the crowd, beyond the clutter created by lot of counterfeits and cheap copies. It matters because it takes effort to create something unique, not from the commercial aspect, but from the value it can bring to the society, to people and the perseverance to bring calmness to an otherwise competitive noise. For us at NuDzine, KidsafeBelt was borne out of a deep concern, concern for the difficulties being faced by parents, concern for the kids and a general concern for the safety of people in our society. That is the reason, KidsafeBelt being the first and the original, enjoys so much of trust from 10,000+ happy parents. Stay Safe. Snug and Secure your loved one with KidsafeBelt. Congratulations To Our Winners !! Congratulations to the winners of our Cute Baby Contest !! Nu Dzine KidsafeBelt team wishes a safe and happy ride along with your loved ones. KidsafeBelt team believes in giving you the very best to ensure you are always safe when riding your two wheeler. It’s no wonder we have been the market leader for over 6+ years with more than 10,000+ satisfied and happy customers. Our products are built with lot of care and our engineers take pride in their thoughtful designs and attention to details. KidsafeBelt is tested for quality, strength and durability and has undergone stringent stress testing to give you the best quality product. Our success depends on your satisfaction. So, don’t settle for cheap duplicates. Go for the original. After all, nothing is more important than your child. Let your friends, colleagues and relatives know about this safety harness. Bohlin was a former Saab aviation engineer who worked on ejector seats. He invented a seat belt that fit over the driver’s torso as well as his or her lap. 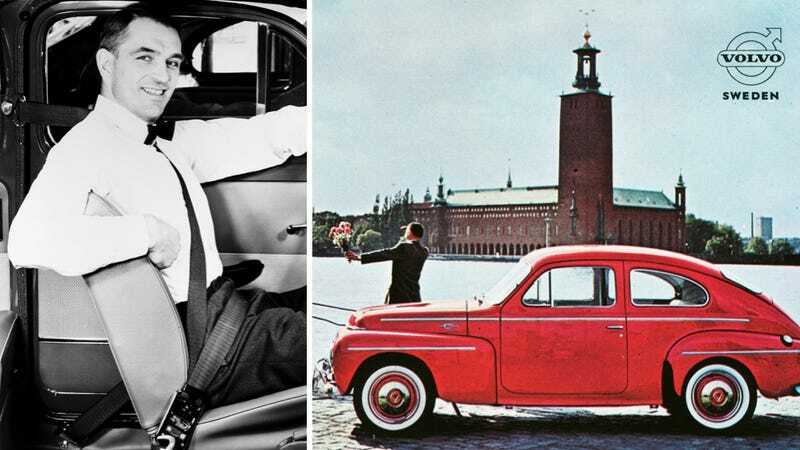 The design was first launched in the Nordic market in 1959 on the Volvo Amazon and Volvo PV544, pictured above. It made its way to the U.S. in 1963. Team KidsafeBelt wishes every proud Indian a very Happy Republic Day. Get together, be the strength of the nation and help it reach great heights. Join hands to make our nation Safe and Secure for everyone. January Contest is ON !! Participate ! Spread the word to your friends, relatives and colleagues…! Take part in our monthly Cute Baby Contest and win this comfortable safety belt absolutely FREE and be a part of 10,000+ and a growing KidSafe family !! Want to know more about the product, the contest and our previous winners? Check our website to find out. Also, please do let us know how KidsafeBelt can help you or why you need KidsafeBelt by sending us your selfie video testimonial to +91 9535 537 591 through Whatsapp or email them to contact@nudzine.com. The baby who gets maximum votes will be our winner this month! You can see all the action at our website. Jump in NOW! Good Luck! *Please note that this baby carrier is designed for babies who are under 15 months old. Try this Baby Carrier !